In the infancy of my wingshooting career, I never worried about carrying any dove decoys into the field. After all, the local dove hunting was good and good shooting always came down to being in the right spot, i.e., the old real estate adage of "location, location, location." Over the years, I've realized that the dove hunting is spotty at best in the part of North Texas I live in, which is a far cry from the good old days when my backyard haunts and the surrounding environs were covered with grain field after grain field. That's not to say that good, even great, dove shooting cannot still be found in my neck of the woods because it still can be. But you've got to work a bit harder for such good shoots and do everything you can to legally tip the odds into your favor. This is the reason why I never go hunting anymore without a sack of one to two dozen dove decoys and at least one Mojo-style spinning-wing decoy. Why? Because curiosity not only kills a wayward feline, it also can help a hunter convince a few more doves to fly by his shooting stand, sometimes enough to fill out a limit. Interested in finding your own wingshooting success with dove decoys this season? Then consider adding these seven tricks to your arsenal, where the use of dove decoys is legal. 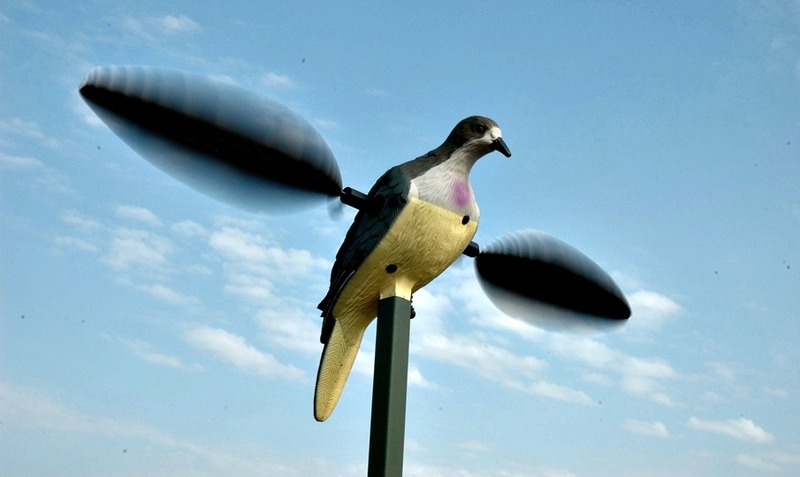 When spinning-wing dove decoys first came out, I'll admit that I was a bit late to the party. After all, who wanted to spend $39.99 for a dove decoy when you could use that money to buy a case of heavy dove loads? However, begrudgingly or not, I've gradually warmed up to the usage of spinners, as my pal, J.J. Kent, likes to call them, because they work. Maybe not each and every time, but often enough to lure in enough stray dove passing by just outside my shotgun range to convince me of their usefulness. Thus, this is why these days, I never leave home without at least one Mojo in my proverbial back pocket. I'll admit that sometimes I'm not very bright and that I didn't come up with this decoy trick on my own, but Field & Stream wingshooting columnist Phil Bourjaily did. Bourjaily wrote a story for Field & Stream a couple of years ago that a dove coming right at a hunter doesn't always present much to look at or shoot at. Because of that, he added, "I think in the future when I find myself on the X, I'll put the decoy 10 to 15 yards to one side or the other so I can take quartering in shots." After missing one too many "can't miss" incoming creampuffs, Bourjaily's advice makes perfect sense to me. When I put a spinning-wing Mojo decoy up, I want any dove that is flying by to think that they are witnessing a party in the making with one bird flying in to join the melee while several other birds gregariously try to vacuum up any food crumbs that exists, preferably before any other birds can join the party. To help with that con job, I'll put a half dozen or more regular decoys on the ground with their heads down in a feeding position to simulate feeding birds around the spinner. Does it work? Well, it certainly doesn't seem to hurt. If there's a section of barbed-wire fence around my hunting spot, and there almost always seems to be, I like to spice things up with several dove decoys clipped onto the wire that literally helped to tame the West. While dove will occasionally be attracted to such fence-sitting decoys, especially when they are sitting in a gap devoid of cover, I want the decoys to run interference for me as much as anything. Meaning that if any birds happen to fly by my hide, I want them to be glancing at the small flock balancing on the barbed wire, not at the camo clad figure getting ready to mount his shotgun and spring into shooting action. I'm not sure what it is about snags and trees with dead sections of limbs, but dove seem to be inexplicably drawn to such spots to rest, look the countryside over, and search for any hiding predators in the cover below. Because of their fondness for such spots, not to mention the added elevation that such locations give to a small bunch of decoys, I almost always try to hang a few dove decoys on barren branches or in snags. With any luck, I'll dupe a few dove into putting on the air brakes, turning my way and moving toward the snag or dead limbs before they are added to the day's bag limit. If you don't have a dead snag handy or are having trouble finding a tree with a section of barren branches then do what I saw one hunter do several years ago and make your own "dove tree." Use PVC or some other sort of lightweight dowel rods or pipes that can form a basic "T." Shove that fake tree into the ground, add a half-dozen or more dove decoys to its "branches" and you're ready for business. It works more times than you'd think. For this trick to work, it has to be the right waterhole, one that is devoid of predator hiding vegetation around the edge of the water. If you can find a dwindling water source that is attracting doves in the late afternoon sun, a few decoys placed on the ground, with their heads down in a watering position, can often be enough to lure in some late afternoon birds looking for a spot to drink before going to roost. There you have it, seven tricks to help make dove decoys another part of your successful wingshooting adventures. While decoys don't always work, they do so just often enough to help occasionally tip the balance in your favor so that you can bag an extra bird or two. The kind that otherwise might have flown on by, but not after they were duped by a bunch of plastic fakes, including one with crazy looking wings that spin.